with garden peas. Prime British pork from pigs born outdoors and reared in airy, straw-bedded barns. 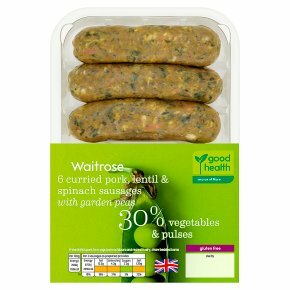 INGREDIENTS: pork (55%), peas, green lentils (7%), red onion, spinach (6%), carrot, potato starch, coriander, pea fibre, sea salt, ground coriander, ground cumin, garlic purée, sugar, ground fennel, ground turmeric, diced ginger, dried red bell peppers, emulsifiers tetrasodium diphosphate and disodium diphosphate, ground black pepper, preservative sodium metabisulphite, ground ginger, ground cayenne pepper, cumin seeds, dried glucose, fructose, ground cinnamon, salt, ground cloves. MEDIUM/HOT HEAT. Grill Time: 14-21 minutes. Preheat grill. Place under a preheated medium/hot grill. Turn occasionally. Cook thoroughly until juices run clear. Check food is piping hot throughout and all meat products are cooked thoroughly. Pan Fry. Time: 14-21 minutes. Heat 1 tablespoon of oil in a non-stick frying pan. Add sausages to hot pan and cook on hot heat for 14-21 minutes. Turn occasionally during cooking. Cook thoroughly until juices run clear and there is no pink meat. Drain before serving.